Slowly but surely I'm getting through my large backlog of posts. 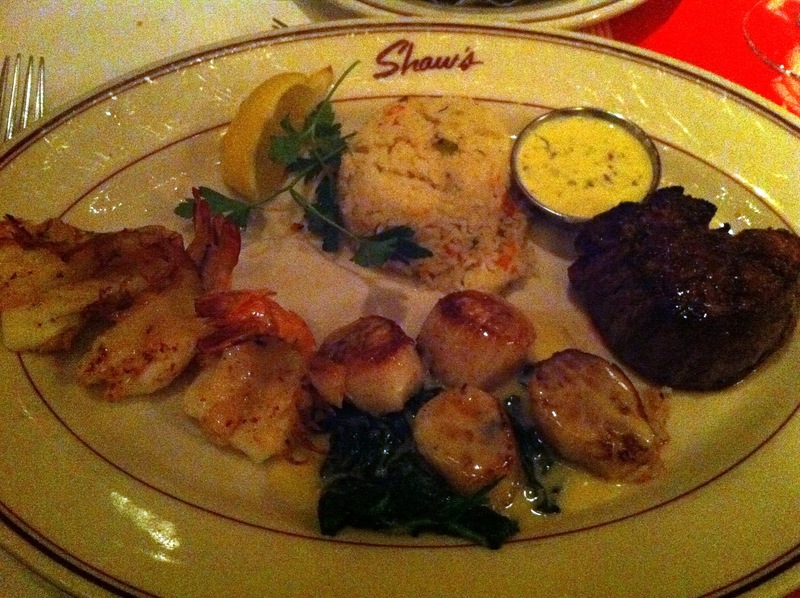 Our dinner at Shaw's was in mid-December "celebrating" the holidays. We had a gift card or two and wanted to splurge for the occasion. Shaw's is an established Chicago institution, especially their no reservations oyster bar right off the main entrance. I can imagine back in the day that if you wanted really good and fresh seafood, you went to Shaw's. Unfortunately for them competition in the space is huge and people can get great crab or oysters or fish from many outlets. My biggest complaint is that Shaw's feels like it is still living in the 60s or 70s without many modern touches. Not to offend anyone, but it reminds me of a place your grandparents would take you to. Maybe that's the point and I'm missing something, but somewhat strange and surprising coming from a LEYE restaurant in this day an age (see: Brasserie Jo turns into Paris Club). The other large disappointment with Shaw's was the value. Most items seemed very pricey, and especially so after we ate them. Erica and I both ordered seafood, not normally a surprise, but it was her small piece of fillet on her surf-n-turf that was the tastiest item on the table! 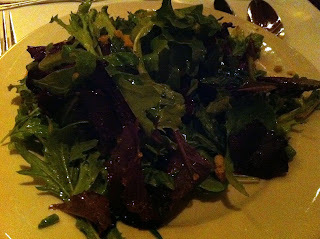 It could very well be a personal mismatch of style and menu, we enjoyed the service and elegance of the old fashion scene, we were dissapointed in the flavors of the food that evening. I started with a salad and Erica ordered her favorite of lobster bisque. My plate of mixed greens was unremarkable and if I remember correctly, slight over dressed. I shouldn't complain too much because I order mixed greens to feel a bit healthier before consuming too much food later in the meal, but I still would like to see something a bit more complicated than what I could make myself at home. Erica did love her soup and was one of the highlights of the meal. Call me a bad blogger, or blame me for waiting too long to write, but I can't remember the type of fish I ordered with this meal. 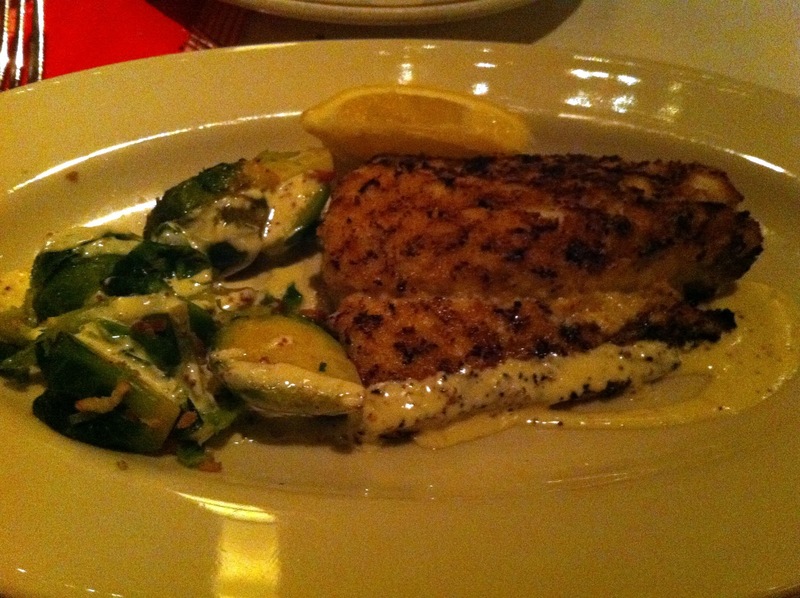 I do remember that it wasn't amazing, and I didn't love that creamy white sauce on the fish and brussel sprouts. It may have been special, but I do give a lot of credit to Shaw's for using and partnering with Shedd Aquarium’s Right Bite Card. It's a great resource to understand which fish are sustainably caught or farmed and which fish to avoid. Sustainable fishing practices are very important to me and I appreciate restaurants keeping that in mind as well. Erica made the better order decision with a seafood surf 'n turf medley. The dish came with shrimp, scallops and a small fillet. I had a bite of the scallops and fillet and was much more impressed than with my grilled fish. We also ordered potatoes au gratin for a side - and that was a handful to get down. 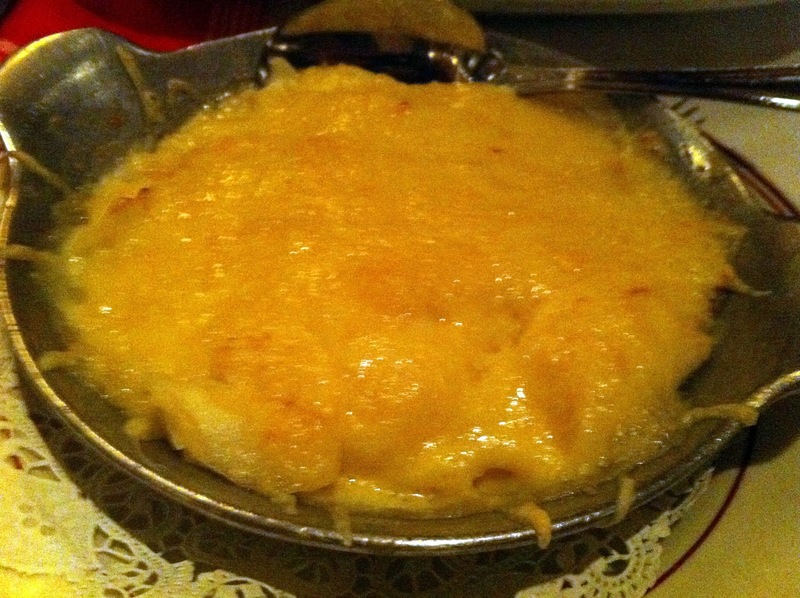 It was a bit cheesy/creamy/rich for my liking, but then maybe I shouldn't be ordering au gratin potatoes. It was a "holiday celebration" dinner for us so we had to go all out and finish with a bang. 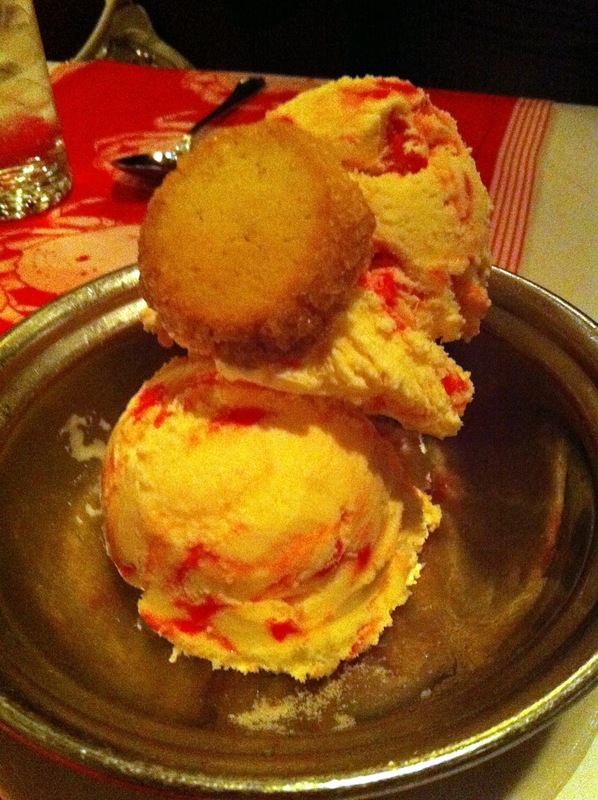 There's no better way than with peppermint ice cream and hot fudge. It was my favorite dish of the night and it did not last long. I'd go back for that alone, or find a way to replicate that in my house. Delicious. Erica certainly out-ordered me that night and if she were writing this post it might have a completely different tone. We both agreed that most people dining were there on a "special occasion" or something similar, but that the space felt dated. The seafood we ordered was disappointing, but we did not have the tradition crab and oyster selection Shaw's is known for. And while we had first class service, our final bill was a bit much for the tastiness of the food and our overall experience. Shaw's is still a quality place with great service and a dependable meal, but maybe it's time to freshen up the experience. I've heard pretty much the same things about Shaws. 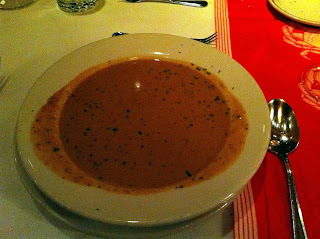 They were pretty traditional at the Chowdah Fest (and somewhat unimpressive). I hear the lobster roll is quite good though. Let's grab food sometime soon. I'm a bit busy right now, but I'll be in touch.